1 photograph : b&w ; 19 x 23 cm. 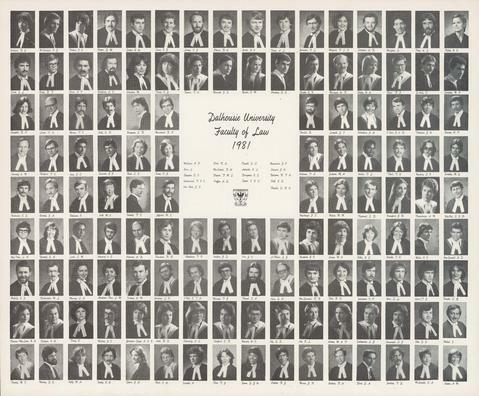 File contains a composite photograph of the Dalhousie University Faculty of law class of 1981. The item consists of photographs of R. G. Wishart; K. J. McFarlane; C. C. Palmer; D. M. Cooper; G. W. Dickie; C. J. Shaw; T. J. Lemay; R. G. Ehrer; A. V. Wirth; A. L. Paton; K. L. Johnston; P. S. F. Medjuck; A. R. Sampson; D. Marzban; W. D. Riley; N. E. Ripley; J. L. Smith; B. P. Casey; A. I. Koven; A. F. Nicholson; M. Haunton; C. D. Payne; P. G. Rogers; J. D. Marriott; E. M. Burke; D. G. Harding; C. F. Crosbie; W. R. Marryatt; N. K. Finlay; B. J. Ryan; S. D'Arcy; M. F. Dempsey; B. H. Campbell; P. K. Large; P. C. Martin; G. R. Kelly; S. R. Ferguson; B. A. Marchand; B. Rendell; J. T. Langille; J. A. Shlossberg; J. V. B. O'Dea; J. W. Pettigrew; W. F. Clancey; O. M. Kennedy; P. E. Radford; S. C. Kent; J. J. Slivocka; S. E. Beal; E. j. Greig; P. A. Williams; M. A. DIckson; P. L. Walter; P. G. Plant; S. C. Newbury; M. E. Dunphy; C. D. Nickerson; J. A. Connely; C. Robinson; M. O. Hebb; P. I. Cassidy; M. S. Jeffcock; J. S. Mackenzie; M. M. Melvin; D. B. Raymond; J. B. Crawford; A. M. Rautaharju; S. J. MacNeil, Jr.; L. A. MacPhee; E. A. Bastedo; S. M. Lynk; V. E. Howard; A. B. Oliphant; R. B. Rawding; P. G. Matthews; J. D. Walker; J. C. Orr; L. J. LeBlanc; J. C. Chisolm; M. G. Stones; K. S. Filbee; J. E. Costello; C. C. Miller; A. D. MacDonald; G. J. Mullaly; M. L. Richardson; S. A. Murray; L. M. Abraham-Pace; W. M. Perkins; L. G. Worthen; S. T. H. O'Neil; P. j. Murray; S. A. Russell; D. A. King; R. B. MacDiarmid; B. K. Pate; C. H. Johnstone; D. l. Weir; P. J. Starr; S. B. Faught; N. G. Rideout-MacLean; K. W. Rodgers; E. Peritz; J. C. McCrea; K. G. C. Johnston-Doyle; B. D. Heck; A. S. Schwartz; S. R. Sanford; W. E. Nearing; D. D. Key; N. L. Key; M. A. P. Hickey; L. J. Dellapinna; D. j. Kavanagh; D. G. Cole; J. Mallal; M. J. Pugsley; D. C. Mackay; M. A. Kelly; K. G. Coady; J. A. Spurr; J. A. Reid; H. Soudek; P. J. Reid; D. J. W. Dunn; R. J. Hughes; J. R. Morris; R. H. Guthrie; D. A. Bird; P. D. Darling; K. A. McDonald; and A. M. Coates arranged in nine rows. A. F. McGuire; L. Kerr; E. I. Chaisson; P. C. C. Underwood; J. F. Von Kleir; R. A. Ford; R. W. MacIntosh; P. M. S. Bryson; A. D. Griffin; D. A. Russell; K. L. Arbuckle; C. S. Berryman; T. F. T. Degen; J. C. Maceachen; J. G. Stewart; R. P. H. Balcome; F. D Cribb; and D. R F. Rinaldi are absent from the photograph.